Oneworld was founded in 1986 by Juliet Mabey and her husband Novin Doostdar. The press is now based in London and publishes over 100 books a year. Most of these continue to be non-fiction titles across a broad range of subject areas. In 2009, Oneworld launched their fiction list, and shortly thereafter began releasing novels in translation. To date, the press has published authors from 40 countries and works originally written in 26 languages. 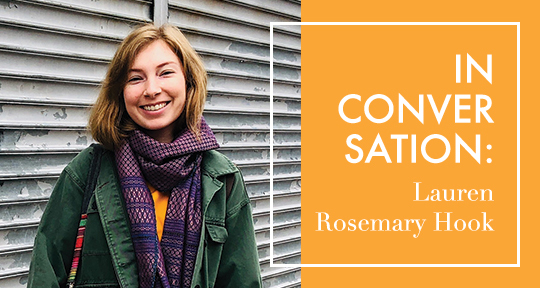 Asymptote’s Editor-at-Large for Argentina, Sarah Moses, spoke to Juliet Mabey over Skype to discuss the importance of reading fiction from across the globe and Oneworld’s commitment to diversity in publishing literature in translation. Sarah Moses: Can you tell me a bit about how Oneworld came to be? 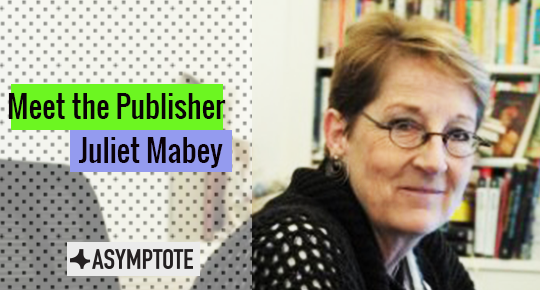 Juliet Mabey: My husband Novin Doostdar and I had always been interested in books and bookshops. We were in university in Edinburgh together, where we met and got married, and we decided that we wanted to set up a company ourselves. It was really a choice between setting up a bookshop or a publishing company. In fact, originally we wanted to set up both, but we never really had time to do the bookshop. We set up Oneworld in 1986, very much with a view of publishing accessible, authoritative narrative non-fiction across quite a broad range of subjects. At that time there was no Internet. If you wanted to learn a bit more about psychology, and you went into a bookshop, all you could find were say, the complete works of Freud or an A-level textbook of an introductory nature. So we felt there was a big gap in the market for books that were written by experts or academics but in an accessible style. That was very much what we intended to do, across philosophy, psychology, history, popular science. In fact, it’s still very much the core of our non-fiction list. The first year in 1986 I think we published four books. We then built it up very slowly. Neither my husband nor I came from a publishing background so we learned as we went along and talked to booksellers and that sort of thing. SM: How did you decide to make the move into fiction? JM: That’s a really interesting question. There were certain factors that came to a head around the same time. On the one hand, I kept reading novels that I felt were very sympathetic to our kind of ethos in our non-fiction list; that if we had a fiction list, we would be interested in publishing ourselves. But of course we didn’t. That went on for a few years before we took the plunge. One of the first novels that was suggested to me was Marlon James’s The Book of Night Women, which we went on to publish the following September, in 2009. That was the start of our fiction list. So we were just incredibly lucky. You know, sometimes it happens. And when you start fresh, you’re not burdened with a big list to look after that perhaps stops you from spotting these little gems that are sitting there, which (in the case of James’s novel) everybody had turned down already because it was written entirely in Jamaican pidgin English. Then his next novel—the second novel we published of his—went on to win the Man Booker Prize in 2015. So it was truly a very propitious start to our fiction list.